As opening solution providers, we often get asked for school security recommendations, and we find ourselves asking more questions than giving answers. Any time you’re focused on security, it’s a complicated issue that is often approached with emotions instead of safety and security. In this post, we’ll outline a few considerations and references, so you can make an informed decision for your students’ and staff safety. This article is meant to start a conversation with your security team and work with them to make the best choice. We are by no means endorsing one action or recommendation over another, although we are keeping in mind life safety codes already enforced. We are always willing to meet with you and your facilities leadership team. We highly recommend seeking out a professional security consultant for an in-depth review of your security plan, preferably one with a Physical Security Professional (PSP) by ASIS International. Whether you are securing and monitoring a single exterior door or a dormitory of living units, we have a solution that fits your security needs and budget. We often see classroom security locks and access control systems as a best practice for school security. 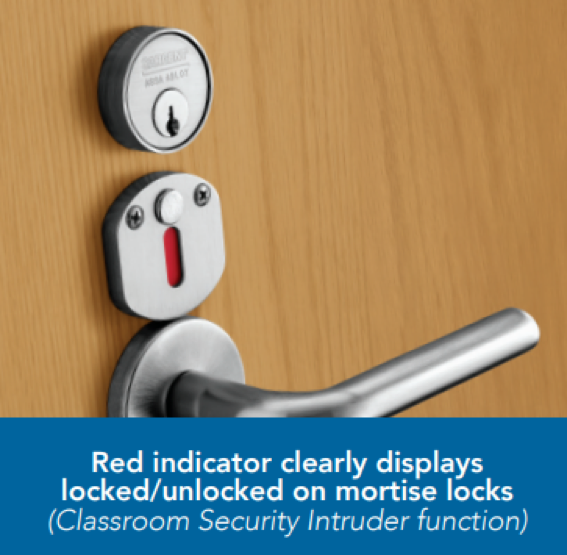 Classroom Security locks with an ‘Intruder’ function are the best means of mechanically authorized controlled security that meet all fire and life safety codes. These locksets have cylinders on both sides of the door and the inside cylinder locks the outside lever. Some even have an indicator on the inside of the door to give a visual notification that the outside lever is locked and secured from unauthorized access.This allows controlled locking of the hall side (threat side) of the door from intruders without opening or barricading the door. These locks always allow free egress by simply turning the lever. These locks cost about 20-30% more than a standard lockset and are made by all commercial lock manufactures. We are seeing many school districts go to this function as their standard classroom lockset. Sargent 8200 Series Intruder lockset with classroom (secure) side indicator. Best 9k Classroom Intruder lockset with secure/unsecure marking for ease of use. 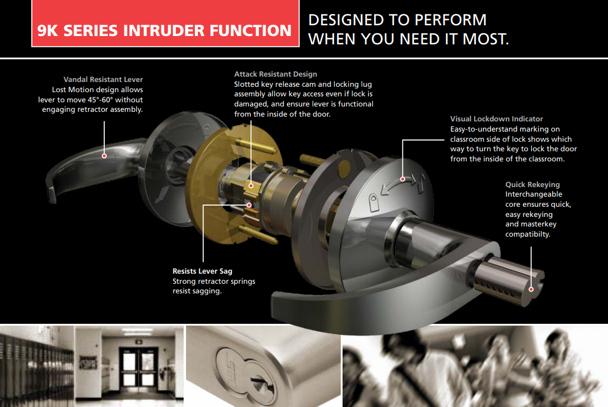 Maintaining all perimeter doors in a latched and secured mode is the first line of defense against an intruder. Designate and maintain a single point of authorized access entry point during school hours for visitors to enter. 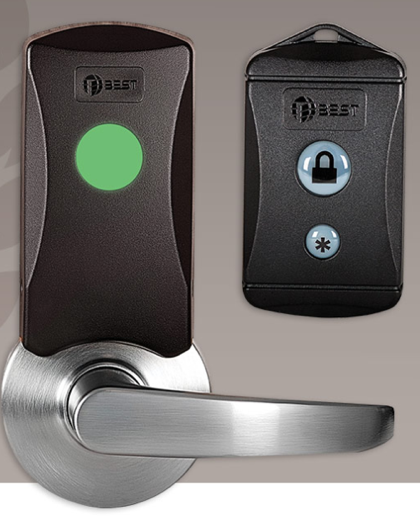 This opening can have remote entry, camera(s) and two-way audio to speak with the visitor. If an intruder does gain access to the facility, a remote locking system can lockdown select hall doors or classroom doors. These systems can range from several thousands of dollars to hundreds of thousands depending on the level of electronics, cameras and quantity of facilities in the district. Click here for more details about a Shelter BEST system. Sargent Profile series with remote lockdown capabilities. While it’s easy enough to Google something, we wanted to put together a list of resources that we trust and often reference. The May 2018 issue in “Door Security & Safety” a publication for door security + safety professionals, has an article Classroom Security Considerations, by Lori Greene, DAHC/CDC from the I Dig Hardware site. Lori’s article and website covers a wider range of topics related to school security and code compliant security issues. “Locksmith Ledger” had an article on Dec 2016 about The Dangers of Door Barricades in Schools by John Woestman, the Director of Codes and Government Affairs with BHMA (Builders Hardware Manufacture Association). This article outlines the importance of complying with building codes, fire codes, and life safety codes that are already in place for the safety of the building users. It also reviews the importance of using extreme caution when installing barricades that inhibit free egress or protection from fire that are already in place for the safety of the user. Lock Don’t Block is a website specifically for school safety related to door openings, created out of need by Door Security & Safety Foundation. This site is dedicated to serving the public by advocating for safe openings. The website is loaded with helpful information from websites, resources and toolkits for school administrators. The website has a great video that informs the pitfalls of barricades that do not consider the life safety and security of the students inside the classroom being held hostage. 1. SSA: Secure School Alliance, a 501© non-profit organization which is working to collaborate with experts in the school safety and security industry to provide information to our nation’s school administrators. 2. PASS: Partner Alliance for Safer Schools is made up of industry leaders who inspire positive change and have an intelligent understanding that sets a big stage for the consultants, manufacturers, and integrators in the life safety and electronic security industry. The expertise they share truly benefits our society and America’s schools. They provide tool kits for K-12 Security Plan Checklist that can be very useful to school administrators and their security professionals. 3. RETA/FEA: Paul Timm with Reta Security, which has recently merged with Facility Engineering Associates, provides school security consulting services and is also considered a leader in the School Security and Safety movement. 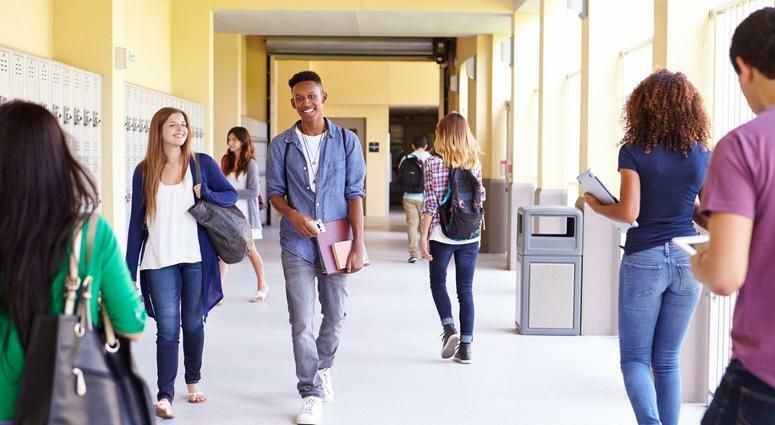 He has published “School Security: How to Build and Strengthen a School Safety Program.” Mr. Timm is often asked to speak at national events related to School Safety and Security. U.S. Department of Education, Emergency Planning, this document is currently under review. The door should be lockable from inside the classroom without requiring the door to be opened. Egress from the classroom through the classroom door should be without the use of a key, tool, special knowledge, or effort. For egress, unlatching the classroom door from inside the classroom should be accomplished with one operation. The classroom door should be lockable and unlockable from outside the classroom. Door-operating hardware shall be operable without tight grasping, pinching, or twisting of the wrist. Door hardware operable parts should be located between 34 and 48 inches above the floor. The bottom 10 inches of the “push” side of the door surface should be smooth. If the school building does not have an automatic fire sprinkler system, the classroom door and door hardware may be required to be fire-rated, and the door should be self-closing and self-latching. If the door is required to be fire-rated, the door should not be modified in a way that invalidates the required fire-rating of the door and/or door hardware. Note that most, if not all, barricade devices do not comply with the list above. If they do comply, they may prohibit free egress and might require special knowledge to operate the device. We discourage the use of barricades and ask all administrators to review the use of barricades with their legal team, security officials, and have the authority to make these decisions before purchasing such devices. In conclusion, using a common-sense approach to school security is usually the best approach. Seek a security professional with experience and knowledge of securing an educational facility. Securing all entry points, designating a single opening for visitors to use and controlled with electronic access control, and implementing classroom security (intruder) locksets should be the foundation of every educational facility. These simple steps have proven to be valuable in ensuring the safety of the students and staff. As parents, we are more than happy to assist. If you desire more insight and guidance, please reach out to our team for assistance. We are commonly brought into these discussions to provide insight and product recommendations for the safety and security our youth. Check out our security product and service offerings or give us a call, (402) 464-6348 for all your security questions.